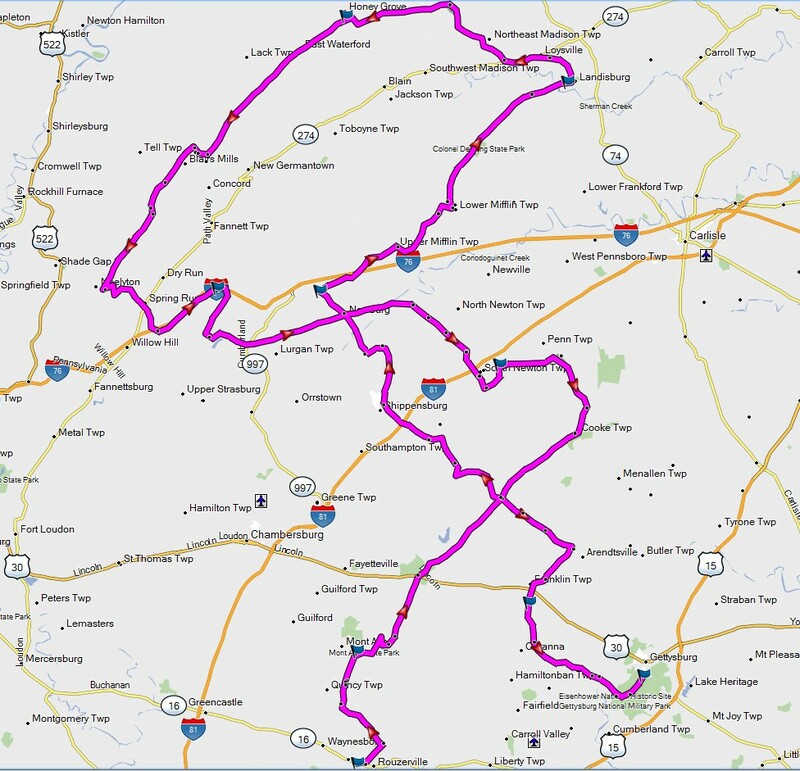 On Sunday, August 27th, the Left Right Up Down #2 will start at 9AM in Rouzerville, Pa for breakfast at the Keystone Restaurant and end up in Gettysburg 185 miles later at Friendly’s on Rt 15 for more food! AAD Greg Puterbaugh put a lot of effort into mapping the new ride, and it includes the detours due to bridge work. Don’t miss this great ride, and please register so we can get a head count for the restaurants. Attached is the ride sheet. The GPS GPX file is too large to attach. PM me with an address and I'll email it to you. Here is the map view of the route. I have it marked on my calendar. Maybe we can ride there together, Steve. Sounds like a good plan Jack, since I'm headed past you. Hopefully I wont get called into work and have to bail in Shippensburg like last year. Greg has too many turns on the ride , so the original .gpx GPS route with more waypoints is too large to attach (Larger than 350K and not permitted by the COG servers). No problem, PM me with your email address and I'll send the route to you. Here is a smaller file attached that will work as well. Might I suggest you start the route a tad differently... instead of turning left from Old Forge Road onto Mentzer Gap, continue straight and enjoy an amazing short trip up through the mountain. Passing the old forge picnic area, cross over the AT, turn left onto S Mountain road at the top, go past the S Mountain Restoration Center, and the National Guard station, then turn right on 233 across from the lily pad pond and a nice ride down to route 30 and continue on your trip as planned. Just a suggestion. That route is definitely filled with left, right, up, downs... Old Forge was closed to replace a bridge a couple weeks ago, but it's open now. First off, welcome to the COG forum since this is your first post. Hopefully you get a chance to introduce yourself and show up for a ride. As far as Greg's ride goes, you have to trust him that it will be good. We love the roads out there, and if you want to put a ride together as you suggested, I'm sure it will be awesome. There is always a road in that area that is new and amazing. PM me if you want to organize something and I'll help you and put it on the calendar. Was out that way last weekend and saw that the work was completed on Old Forge Rd., and they did a great job on it. I had originally planned on going that way but was afraid the project wouldn't be done in time. Chris M definitely has the right idea-Old Forge is a masterpiece of macadam! I would like to meet that "Mac Adam" sometime. He hasn't shown up in my County for a decade. Might come, got room for an overweight sport tourer ( the bike that is ), not sure if I should take the wing or the C10. How many are looking at going ? Take the C-10. I know of at least seven that are riding so far, including me. Never been to Rouzerville, PA. There is one gas station to the East, and many to the West of the Restaurant. Fill them tanks because it's a long ride. It looks like a straight shot down Route 116 (bypass Gettysburg) to Route 16, about 60ish miles. 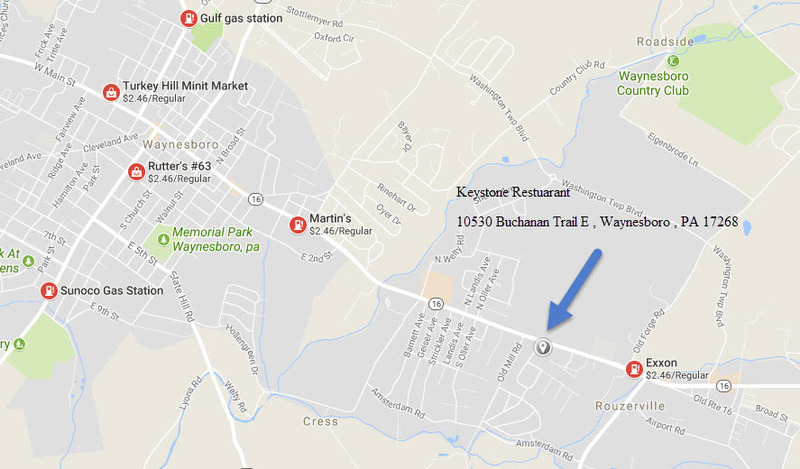 How about we meet 7:15 AM at Rutters's store #16 at the intersection of Route 116 and Route 30? If anybody else wants to tag along from our area, chime in. I'm in, With the new wife! Best part is I don't have to ride slower two up! Whoa ^ This should get more of an explanation please! We got to meet Matt's pillion for life In Staunton, so I'm over the She says she likes to go fast, meaning she chose wisely. Great ride by Greg Sunday. Vickie very much enjoyed the ride and the friends. Page created in 0.45 seconds with 26 queries.